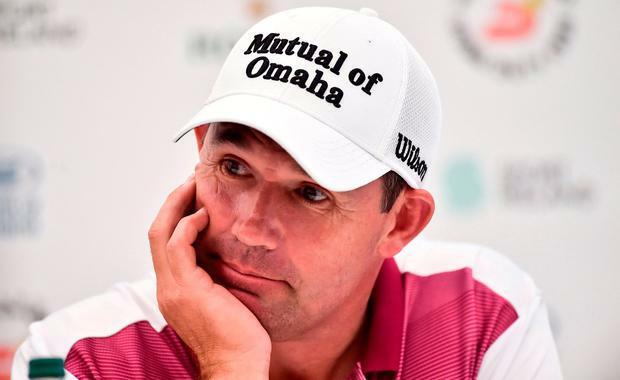 Padraig Harrington is ranked 268th in the world and seeking a first win since 2016, but believes he should still be among the favourites for a second Dubai Duty Free Irish Open title. Defending champion Jon Rahm and four-time major winner Rory McIlroy are the 7/1 joint favourites to win the fourth Rolex Series event of the season at Ballyliffin, which boasts a prize fund of £5.3million and a first prize of £885,000. But although Harrington has missed the cut in seven of his 12 events in 2018, the 46-year-old Dubliner was surprised to find himself rated a 66/1 chance - or higher - to demonstrate his prowess on links courses and lift the trophy in Donegal. "I tell you what, the bookies don't normally get it wrong but they priced me up like we were playing a parkland course," said Harrington, who won the Irish Open in 2007, two months before claiming his first major title in the Open Championship at Carnoustie. "66/1 would probably be a reasonable price on a parkland course, but on a links golf course, that's a surprise." Told of the low price on joint favourites Rahm and McIlroy, who are ranked fifth and eighth in the world respectively, Harrington added: "They may be more likely to win this week than me but there shouldn't be 59 points between us." Harrington has at least made the cut in his last three starts this season and was fourth in the Scottish Open at Dundonald last year, despite a 79 in the third round. "It's not like I'm looking for everything to be fixed," Harrington added. "There's one or two little things going wrong and they can click into place at any time. "When you're at home on a golf course like this, it's a lot easier for those things to fall into place. "The nature of the game for me now is to win or nothing. Finishing 10th is no fun to me. Maybe I put myself under too much stress when the gun goes, but I've shown that if I can get myself into that position where I have a chance of winning, I only play better down the stretch."